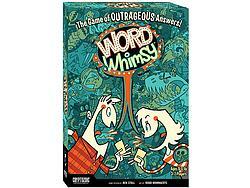 Word Whimsy is an easy to learn and quick to play party game that will have you and your friends laughing at each other's crazy ideas, creatures, and titles. Each round there will be a prompt card, such as “Good Name for a Metal Band” or “Most Likely to Win in a Fight,” and each player will build an appropriate phrase or title out of the various zany word cards in his or her hand. Each round, one player will be the referee and award points to the other players based on how much the referee likes each submission. So whether your “Favorite Bar” is “The Unexpected Walrus” or “The Angry Robot Death Goblin,” Word Whimsy is sure to be a good time for any group of friends!